As of version 9.0, SCRATCH comes with an option to create a direct link between SCRATCH and The Foundry Nuke (S2N). 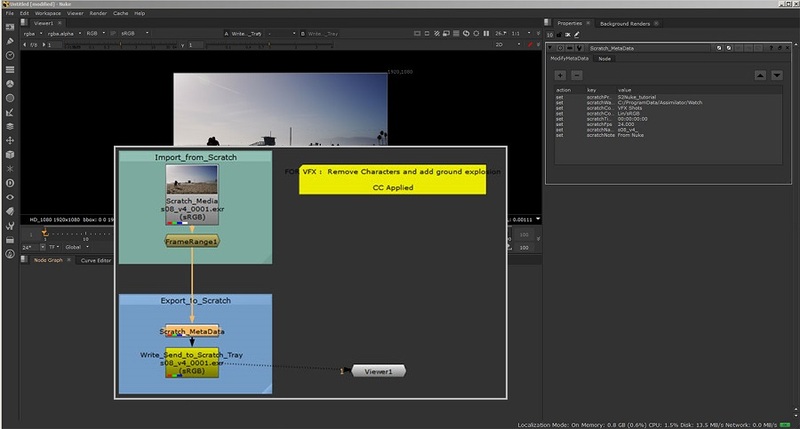 To make this link work properly there are a number of settings you need to enable in Nuke. The script to interface between SCRATCH and Nuke is written in Python. You need the Python interpreter (preferably version 2.7) installed on your system which can be downloaded from here: https://www.python.org/downloads/release/python-2715/. During the installation, make sure that python is added to your system PATH variable. If you're using Windows, use the Windows x86 MSI installer (not the 64 bit variant). The next step is to create a Custom Command in the corresponding tab in the System Settings panel in SCRATCH of the correct type. When you select the custom command type to be Nuke, SCRATCH will try and locate the Nuke executable itself. If it can not detect it or when you want to point to a different version of Nuke, you can set it manually by using the Set button. In the Title field you enter the label that you want to display on the Custom Command button inside SCRATCH. 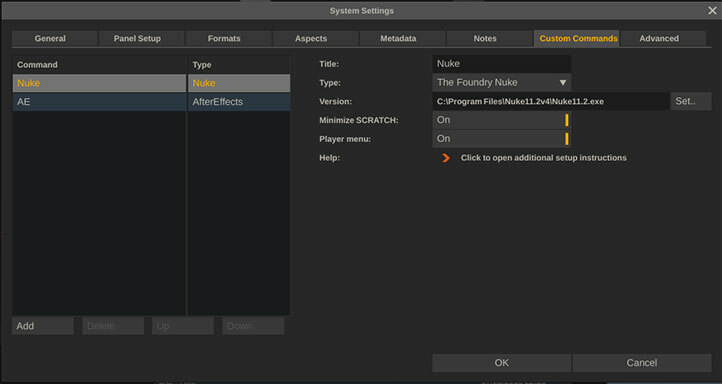 In addition, you can set options to Minimize SCRATCH when clicking the Custom Command to switch to Nuke and to include the Custom Command in the right click popup menu in the SCRATCH Player. To round-trip from Nuke back into SCRATCH, make sure that the Watch folder is setup properly in the Generals tab of the System Settings. To setup the S2Nuke scripts you need to copy two python script files init.py and the s2nuke_utils.py into the .nuke folder. Please note that the .nuke folder might be a hidden folder. When clicking the Custom Command in SCRATCH, Nuke is launched and a pre-configured composite is loaded. If Nuke is already running on your system the S2Nuke function uses the clipboard to pass information from SCRATCH to Nuke. In Nuke you just use the Paste function (Ctrl+V or CMD+V) to create the composite with the shot from SCRATCH. Import from SCRATCH. This group contains a Read Node with the selected shot and a Timeclip Node for adjusting the timing based on the shot input. 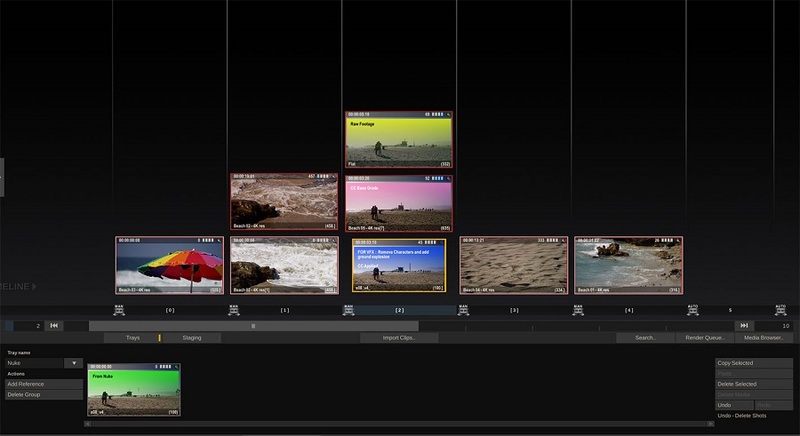 Tip: be sure to set your timeline in Nuke to Input and not Global to get the good frame-range of the shot. Export to Scratch. This group contains a Metadata Node with information on your Scratch project (note that you can modify that information) and a Write Node with the render path already set into your project Media Folder (into a new sub-folder '../Nuke/Your-Shot-Name/' ). The Write Node has a Post-Render script that writes an xml file into you SCRATCH Watch Folder. When you render the Write Node, the exported shot is automatically loaded into the Tray of your SCRATCH project and you are notified in SCRATCH by highlighting the Tray button in blue. Next, drag/drop the new shot into your timeline / composite and you're all set!